What a wonderful summer we are having- lots of sunshine which is great for the alpacas so they can absorb the vitamin D that they require. However it was a bit of nightmare keeping them cool before they got sheared, which wasn’t until the end of June! April & May were fairly quiet months in the shop and with the animals. I did however make the decision to downsize my herd due to lack of grazing and having a bumper year of crias in 2017 it pushed the numbers up. It is a very hard decision to make as they are all home bred and very much loved. I have sold 8 in total – all have gone or are in the process of going to good homes which leaves me with 9 now so it’s a nice number for the facilities that I have. I hope to have 2 cria next year which will still be a manageable number and I love having the babies running around! The markets and festivals have started to get busy now which will be ongoing until the end of the year – these are listed on the Events page. 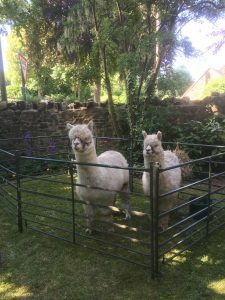 We had a lovely outing to a our local Cancer Research Tea Party at the end of June – we took 2 alpacas Wizard and James (who is a youngster and has never been anywhere before). Luckily it’s a short journey in the trailer and was just for the afternoon. There was a lovely shady part of the garden for them as its was a very hot day and they still hadn’t been sheared, but they coped very well. They always cause a lot of interest with people and we had a competition to name the youngster as at the time he didn’t have a proper name so at the end of the afternoon the name was pulled out of a hat and he was christened James! A very successful afternoon for Cancer Research as they raised over £2000!! We have our last crochet workshop next week in the shop and then they will re-start in the Autumn after the summer holidays. Wishing everyone a lovely summer.